How Do You Keep The Music Playing? Adopt A Student! The Branson Regional Arts Council is looking for a few angels who would be interested in furthering the goals of our Youth Education Program of developing artistic, cultural, and educational opportunities for children in our community. These experiences allow students to gain the confidence and skills necessary to become successful in the field of musical theatre, as well as providing community leadership opportunities. These lifelong tools for success help them become innovative thinkers throughout their educational years, and their leadership experience will assist them in pursuing the career path of their choice. BRAC recently launched a new musical theatre program for children in our community called “STACCATO”. Staccato is an advanced musical group that combines a challenging music repertoire with entertaining choreography. This show choir provides a unique, one of a kind, arts education experience for young students in the Branson area. EXCITING NEWS!!!!! The kids in STACCATO have an amazing opportunity to perform at a variety of locations in the Orlando, Florida area including FESTIVAL DISNEY with other Show Choirs from across the country. We have been working for months to raise the funds necessary to make this awesome opportunity a reality, and we’ve also reduced our travel expenses so that our goal is more achievable. Each student must now raise $700 to participate in this “once in a lifetime” educational opportunity. The money raised will go towards providing transportation, food, airfare, fees and travel expenses for this weeklong trip and competition. We must reach our fundraising goal by February 15th. Can you help make this dream a reality for our students? If you are sponsoring a specific student, please notate their name on your check. We appreciate your generosity, and THANK YOU for your support of STACCATO! 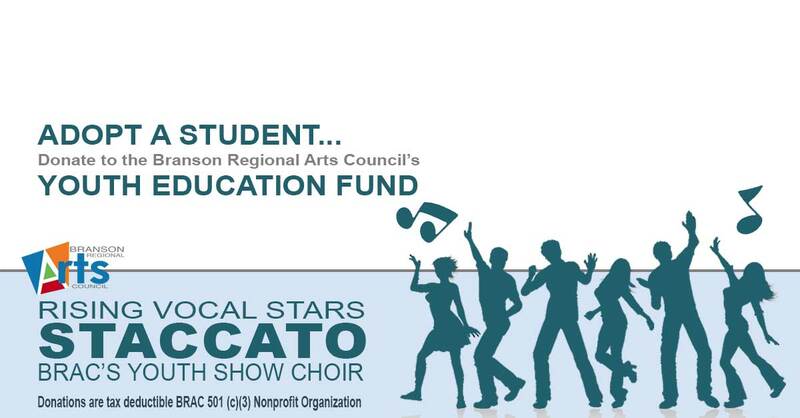 https://bransonarts.org/wp-content/uploads/2019/01/BRAC-AdoptAStudent-1200.jpg 627 1200 Branson Regional Arts Council https://bransonarts.org/wp-content/uploads/2017/03/BRAC-HeaderLogo.png Branson Regional Arts Council2019-01-18 11:56:082019-01-18 11:56:08How Do You Keep The Music Playing? Adopt A Student!